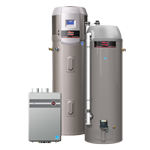 Ruud Water Heating is the industry leader for total water heating solutions. In fact, Ruud is the brand with extensive product offerings covering conventional tank-type water heaters, tankless water heaters, replacement parts and accessories for all categories–making us a one-stop solutions provider. Never think about your hot water needs again: Innovative technology provides an endless supply of hot water whenever and wherever it's needed–even for simultaneous uses at multiple fixtures. Showers and baths? Absolutely. Laundry and dishes? No problem. Prioritizing activities and scheduling hot water use is a thing of the past. Because they operate on an as-needed basis, Rinnai Tankless Water Heaters can use up to 40 percent* less energy than traditional systems, which helps reduce utility costs. This efficient operation can also contribute to a favorable HERS rating and optimize LEED certification. On top of efficiency, our tankless water heaters feature a copper heat exchanger for unparalleled quality, durability, and safety. And their compact design offers substantial space savings in the home. *As based on the average cost to run an electric tank water heater per the DOE Average Energy Costs (www.doe.gov).